I’m always on the lookout for tools that I think can make investing easier for people. While we personal finance writers think of investing as really straightforward, the truth is, the logistics of investing really isn’t as simple as we make it out to be. It’s easy for us because we’ve spent hundreds of hours reading and learning about money and investing. Tell me to put my money in a total market fund with Vanguard and I can do that pretty easily. But tell your average person to do the same and I guarantee they won’t understand how to do that. In an ideal world, investing would be as easy as opening up a bank account. Your average person could just go online, open up an investment account, and then walk away without having2 to make any decision other than deciding how much money to put into their account. This is why I’m such a big fan of robo advisors. These investment platforms are basically the closest we can get to having investing be as easy as opening up a bank account. Just open up an account, put in some money, and walk away. Your money then gets invested in a well-diversified portfolio appropriate to you. Paying a management fee of 0.25% or so is well worth it, in my opinion, if it helps someone figure out how to invest their money. Even better though is if the robo advisor charges no fee at all! Today, I want to talk to you about a completely free robo advisor that I’ve been using for the past two years called WiseBanyan. WiseBanyan is a robo advisor similar to Betterment or Wealthfront. You give WiseBanyan some information about yourself – things such as your risk tolerance, age, goals, how much you’re trying to save, etc. – and WiseBanyan will provide you with a recommended asset allocation of stocks and bonds appropriate to your situation. After that, all you have to do is deposit some funds into your account and WiseBanyan will go ahead and invest your money for you according to your asset allocation. WiseBanyan currently supports taxable accounts and non-taxable accounts such as an IRA, Roth IRA, or SEP-IRA. The key differentiator for WiseBanyan is that, unlike other robo advisors, WiseBanyan charges absolutely no management fees. As a result, the primary criticism of robo advisors – that they charge you for something that you could do by yourself – doesn’t apply to WiseBanyan. 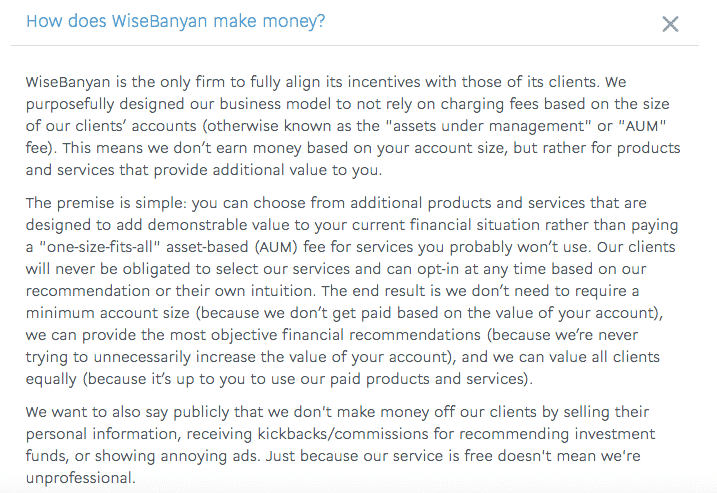 With WiseBanyan, the only fees you’ll pay are the underlying expense ratios of the funds that you’re invested in. These are costs that you can’t avoid, even if you took a DIY approach to investing. Rather than make money from management fees, WiseBanyan instead makes money by charging for optional, premium features. For example, if you opt to activate tax-loss harvesting, WiseBanyan will charge a management fee of 0.25% in order to tax-loss harvest your account. If you don’t activate tax-loss harvesting, you won’t pay the fee. WiseBanyan’s investment philosophy is similar to the philosophy that most smart financial folks adhere to these days: diversify, keep costs low, and go for passive index investing. 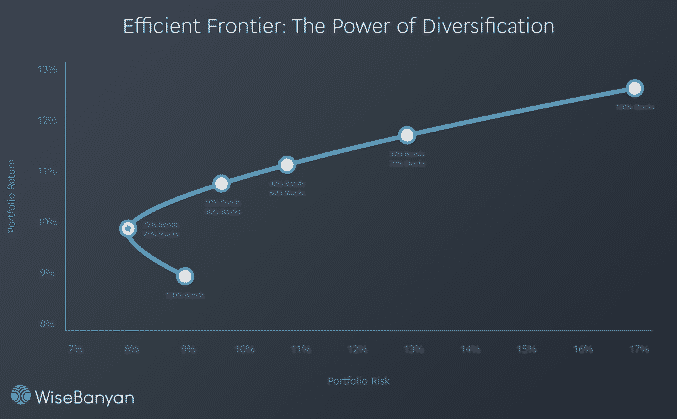 They use modern portfolio theory, which is pretty much a fancy way of saying that you’re maximizing your return for a given asset allocation while taking on the least amount of risk. The goal in modern portfolio theory is to stay on the below line – i.e the efficient frontier. In keeping with its philosophy of low cost investing, WiseBanyan will generally invest in low-cost Vanguard ETFs, although it’ll also sprinkle in ETFs from other companies if you opt to activate tax-loss harvesting. According to WiseBanyan, the average expense ratio of the funds it invests in is 0.12%. That’s pretty darn low. The short answer is, yes! WiseBanyan is an SEC registered investment provider and your funds are insured for up to $500,000 by SIPC. In other words, if WiseBanyan somehow became insolvent, you’d still be covered. Basically, what all this means is that WiseBanyan is a legit company and you’re not going to lose your money in some sort of Ponzi scheme. 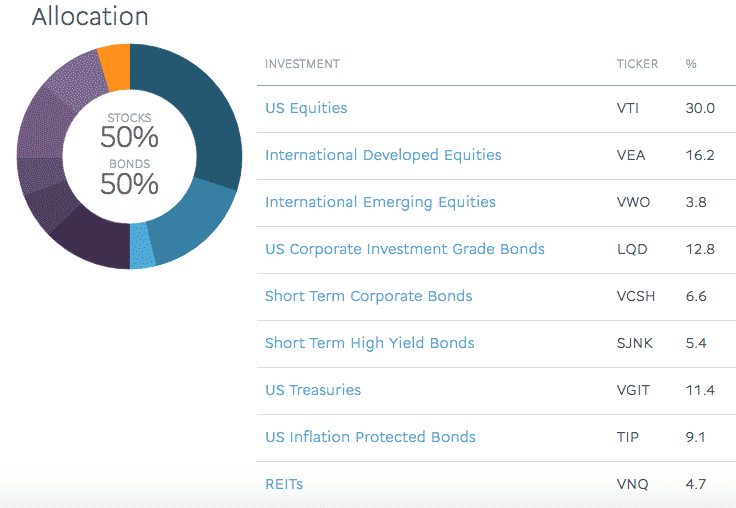 There are two options when it comes to setting up your stock/bond allocation with WiseBanyan. 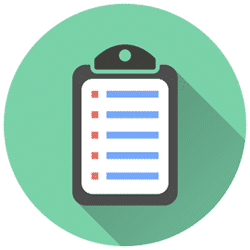 You can either manually set it to whatever you want or you can answer a few questions and WiseBanyan will choose an appropriate portfolio for you based on your particular situation. For example, here’s a conservative portfolio that WiseBanyan put together for my own account. I personally have been using WiseBanyan in order to save for a new computer. Since I might want that money in the next few years, I opted to go for a conservative portfolio of 50% stocks and 50% bonds. In terms of allocation, WiseBanyan does let you tinker with it on your own if you’d like. You can set it to be as aggressive as 91% stocks and 9% bonds or as conservative as 9% stocks and 91% bonds. WiseBanyan is taking a novel approach to robo advisor services, so naturally, we have to wonder if it’ll make it long term. There’s always a possibility that they find out that their business model isn’t sustainable and thus, they’ll either have to charge fees or shut down entirely. If you have a significant amount of money in a taxable account, this could potentially be problematic. I’m not quite sure how it works, but I imagine you could be forced to liquidate your investments and move them to a different brokerage if something were to happen. 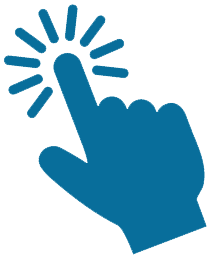 If you’re using WiseBanyan to house your non-taxable accounts such as an IRA or Roth IRA, then you won’t need to worry if WiseBanyan decides to charge fees or shuts down later down the line. In that situation, you could just move your funds into another Roth IRA and you wouldn’t have to worry about any taxable events. Given this possibility, it might make sense to use WiseBanyan primarily for your non-taxable accounts. One other thing to consider with WiseBanyan is that it doesn’t let you go to a 100% stock allocation. I’m personally of the opinion that someone with a long investing time horizon doesn’t need any bonds in their portfolio. WiseBanyan, however, will only let you set a portfolio with a max of 91% stocks. Not a dealbreaker by any means, but something to consider if you’re a 100% stock proponent like I am. Finally, another thing worth noting is that WiseBanyan doesn’t link to Mint or Personal Capital, which is a bit of a bummer for those of us that like to track our accounts in one place. They keep saying that it’s something that’s in the works, but I haven’t seen any progress on that front in the two years I’ve been a WiseBanyan client. I think WiseBanyan is the perfect robo advisor for anyone who’s just starting out with investing and has absolutely no interest in figuring this stuff out on their own. As crazy as it is to think, most people out there don’t want to learn about asset allocations or expense ratios or all that other stuff that a lot of us find so thrilling. For someone like that, WiseBanyan is the perfect solution. I probably would be wary about using WiseBanyan for a sizeable taxable account. You never know what might happen in the future, and if WiseBanyan shuts down or decides that it needs to start charging a management fee, you might be left in the position where you’ll need to liquidate your account and incur some tax liability. That’s why I think WiseBanyan is perfect for someone looking to start up a Roth IRA. If something were to happen, you could easily transfer your Roth IRA to another company without worrying about any tax issues. If you’re on the fence about using WiseBanyan, I’d say it’s, at a minimum, worth trying out. With no fees and a $1 minimum deposit requirement, there’s basically no downside to opening up an account. WiseBanyan is definitely unique in offering a totally free robo advisor service. I’ve been a WiseBanyan user for the last two years (I’m labeled as a “founding member”) and have had a good experience so far. The main criticism of robo advisors is that they charge fees for things that you could probably do on your own. If fees are the main criticism, then you really can’t beat a robo advisor that charges no fees at all. The biggest criticism of robo advisors is that they charge for the service, but if you have a free one, then I don’t really know what the criticism would be. It’s not a financial advisor though – I think financial advising is a totally different thing. The main benefit is that it gives someone an easy way to invest properly. 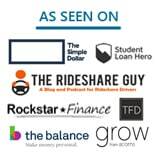 There are so many people out there who don’t really know how to get started, and honestly, probably the absolute easiest way to get started would be using something like WiseBanyan. (Yes, it’s easier than opening up an account at Vanguard – trust me, I’ve told people to open up accounts at Vanguard and then they have no idea what to do next). This is awesome. I’ve recently been looking into investing but hadn’t known where to start or what to do. This is amazingly detailed. I need this info so thank you for the post! Sounds interesting. I often wonder about projections as I have learned over the years that a lot of the time after a big rise things fall pretty quickly. It would be interesting to watch this over a period of time. Yep, I can guarantee that the market will fall – a crash is always coming. But it’s all about time in the market. Stick it out and you’ll always do well so long as you have the right asset allocation for your situation. This is not a topic I know a lot about, but as a recent college grad I’m trying to learn all I can. Thanks for posting! This is very interesting. I will have to show this to my husband, I am sure he would enjoy reading this. Thanks for sharing! On the surface, WiseBanyan does sound like a good option for someone who doesn’t know how to invest at all or just starting out. However, it can also prove to be a bigger headache for the new/naive investor if they are forced to liquidate or transfer their investments or have to submit claims with SIPC. It’s never fun to deal with any of such situations even for an expert or a seasoned investor, let alone a newbie. For someone just starting out, I normally recommend them to go with a well established brokerage or investment firms such as Fidelity, Schwab, or Vanguard. That’s a good point about the potential to have to deal with the headache of switching if something does happen to WiseBanyan. I suppose that’s pretty much true of any of the new startup robo-advisory companies out there. We don’t know whether the business model they have is something that can last for the long term. I suppose my own thought is that, even telling someone to open up an account at Fidelity or Vanguard isn’t that easy. I know it’s easy, but it’s only easy if you know what you’re doing. I remember the first time I set up a Roth IRA back in 2008, on the advice of a book I’d read. There was no walk through guide or anything, so I had no clue what I was doing. Same goes for Vanguard. My buddy opened up a Roth IRA with Vanguard on my recommendation a few years back, then came back to me because once he did that and put his money in, he had no idea whether it was invested or what he needed to do. Even just saying, go for an index fund, is basically gibberish to most people out there. It’s why I like robo-advisors so much – it just removes so much of that friction. I can literally tell anyone to open up an account with any robo-advisor, put in as much as you can, and that’s all they need to do.